Life, Doctor Who & Combom: Doctor Who trends on Twitter for over 3 hours! Doctor Who trends on Twitter for over 3 hours! As you can see 'Dr Who' was trending on twitter earlier today because of the episode which is airing later tonight on BBC 1. 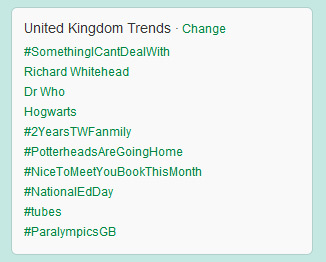 As of 13:03, continues to trend in the UK. That picture is one of the rare occasions where One Direction isn't trending..